It's jarred. It's labeled. It's amazing. I sold my first two jars yesterday to someone who ordered it in September. "I used to have a honey guy but I think he died." When I'm in a tree with a sharp saw and my smoker (also known as a can of fire), in the rain, wrestling a swarm of bees, or laid up with a nasty sting on my ankle which is so swollen it feels like it might burst, or wearing a suffocating bee suit when it's 105* I think it might kill me too. You really haven't lived until you've tried to get 20 thousand bees in a box. You can see the queen cells in the photo below. This means these bees are planning on swarming. After being left in the box overnight, you can see that they had already started building comb. And below, peace in the most organized sorority in the world. So productive. Above capped honey. Below the frame they started with. Love this frame where you can see their handiwork. I uncap it and it looks like this. Next it goes into the honey extractor, which works by centrifugal force. 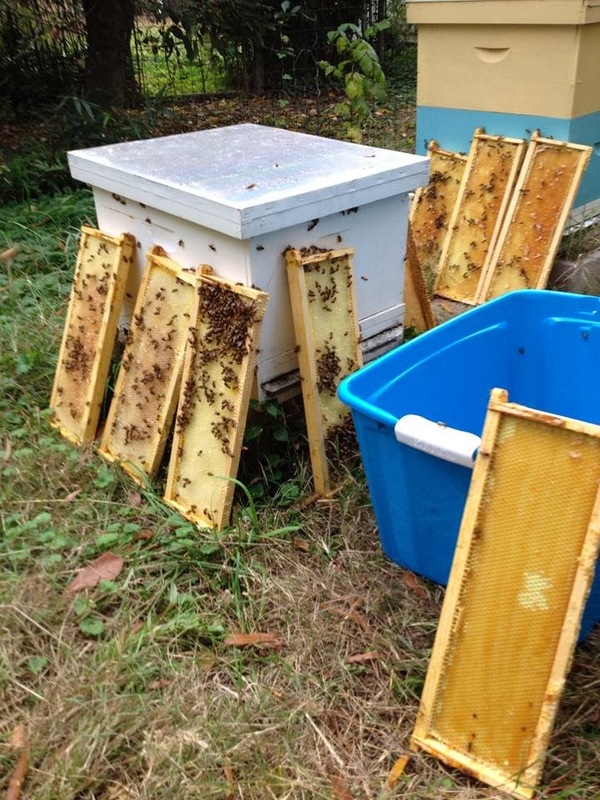 In the middle picture above you can see what the comb looks like once the honey is "slung" out. The now empty frames go out next to the hives and the bees will clean them to perfection. Then they can be stored over the winter so the bees don't have to rebuild the comb next year. They can go straight to honey production. 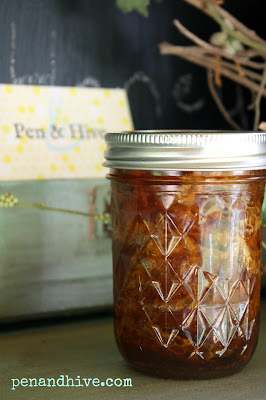 Another way to extract honey is just to scrape it right off the frame into the jar. That's how I'm doing it since this post. People have been loving the raw unfiltered honey with comb in it.